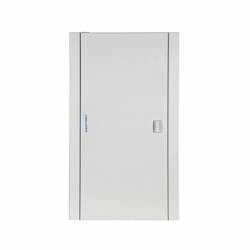 Exporter of a wide range of products which include spn double door distribution boards, tpn double door distribution boards, tpn vertical double door distribution boards, phase selector double door distribution boards, 8 segment double door distribution boards and plug and socket distribution boards. SPN Distribution Box is assembled with leading technology and universally accepted norms along with the finest quality material. We are able to offer our clients a wide range of SPN DB with best quality. The products offered by us are available in various specifications to meet the different demands of the clients.Made available in several specifications and at the most reasonable rate possible the offered SPN Distribution Box is known to be highly demanded in the market. Neutral Bar terminal capacity 25 sq.mm. Earthing Bar Terminal Capacity 25 sq.mm. TPN Distribution Box is assembled with leading technology and universally accepted norms along with the finest quality material. We are able to offer our clients a wide range of TPN DB with best quality. The products offered by us are available in various specifications to meet the different demands of the clients.Made available in several specifications and at the most reasonable rate possible the offered TPN Distribution Box is known to be highly demanded in the market. TPN Vertical Distribution Board has provision for (MCB / Isolator / RCD) incomer and single phase outgoing. Separate neutral links can also be provided for per phase isolation. These Distribution Boards come with earthing link, tinned electrolytic copper busbar and wire sets for cable management. Top and bottom, removable gland plates with knockouts. Mounting of these boards can be flush or surface. Phase selector Distribution Boards with provision for mounting 3 nos. selector switches or automatic phase selector switches as well as provision for MCB / Isolator / RCCB as incoming and SP MCBs as outgoing. Top and bottom removable gland plates with knockouts. Our Phase Selector TPN DBs are suitable for all kinds of industries and can be installed with ease and save lot of time over other products. 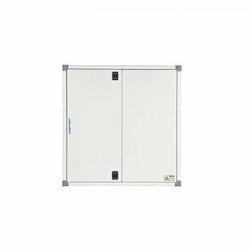 7,8 Segment Single Door Distribution Board is supplied with top bottom detachable gland plates with knockouts for cable management. It is not merely an enclosure but a comprehensive system in itself, comprising of copper bus bars, brass neutral links, and earth links to facilitate effective distribution of current. 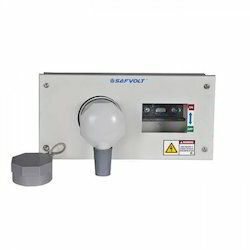 The New improved SAFVOLT Metal Clad Plugs Sockets are specially designed incorporating the most up-to-date safety, quality and user friendly features for small offices to heavy duty industrial applications. 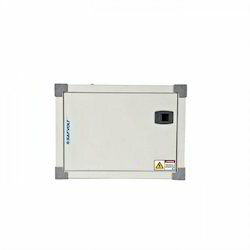 We make Miniature Circuit Breaker (MCB) Metal Enclosures as per customer requirements. 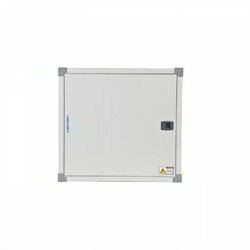 These enclosures are made of standard sheet steel of thickness to suite the domestic and commercial applications. Fixed door is provided with screw option for extra safety. 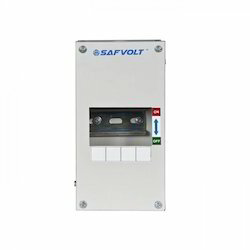 We make Miniature Circuit Breaker / MCB Metal Enclosure as per customer requirements. 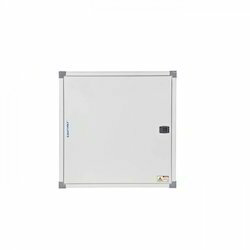 These enclosures are made of standard sheet steel of thickness to suite the domestic and commercial applications. Fixed door is provided with screw option for extra safety. Looking for Distribution Boards ?